On album number two, the four members of Germany's rock band Zodiac cover a lot of ground from the album's opening, AC/DC-like, number "Downtown" to "Free" (which features some classic rock guitar playing that wouldn't have felt out of place on Funkadelic's "Maggot Brain") and even "Leave Me Blind", a semi-soft piano-ballad. And they do it all while coming across as a (long time in the making and well-seasoned) veteran act. When you consider the group's true age though, as they were only founded back in 2010 by drummer Janosch Rathmer (Long Distance Calling) and singer/guitarist Nick van Delft, it's all the more impressive I'd dare to argue. Three years on and the pair, which were eventually joined by guitarist Stephan Gall (ex Rocketchief) and bass player Ruben Claro, sound as if they have hit on a winner formula with "A Hiding Place". 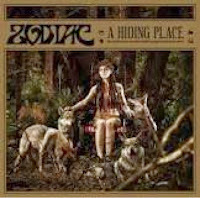 With the help of producer Martin Meinschäfer (Henrik Freischlader, Donots), who also produced the group's well-received, 2012 debut-album, "A Bit of Devil", the gentlemen in Zodiac release an album that was made by rock musicians for rock fans. While this young group chooses to cover Neil Young's "Cortez The Killer", and in fine fashion I must say, they do come across as a youthful and enthusiastic modern rock band with a sound that (one would think) should bring in today's young generation of rock fans. True, it is their 70's love-feast (with group's like Led Zeppelin, Deep Purple, Thin Lizzy and many others serving as a sort of blue-print for Zodiac) that will appeal to most listeners and with good cause. But, rock is an ageless institution so hopefully this talented, up-and-coming act will find fans both young and old. If this album is any indication then these guys are in for even better days ahead.